Contact Olympus Corporation for detail of camera / underwater housing. INON Inc. confirms product compatibility based on a camera/housing available in Japan. The Set includes 「Protector II」 protecting lens surface of Dome Port from accidental damage. The Protector II also helps to suppress flare/ghost in backlit condition and is recommended to use all time. Does not have MRS Control Ring which controls focus ring of the lens. 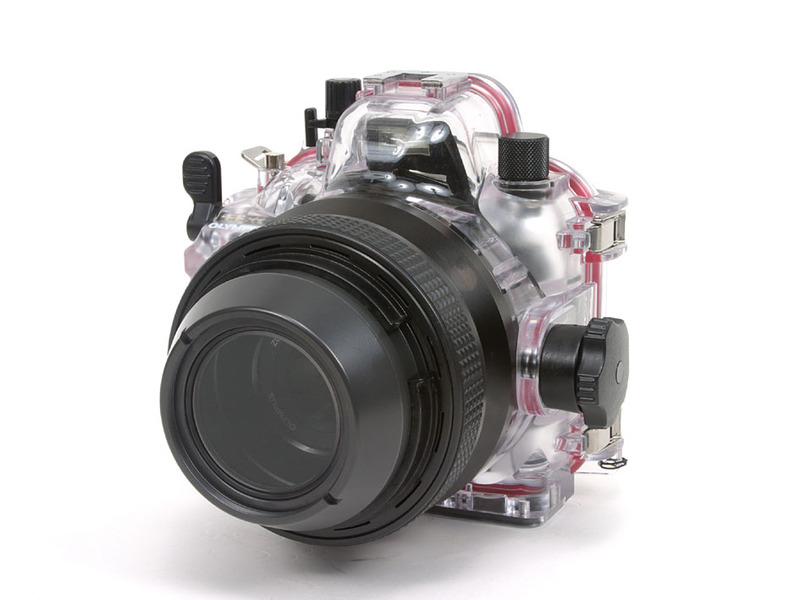 Suitable for a user using only “auto focus” or using Olympus focus gear 『PPZR-E04』 to control "zoom dial" on the water-proof protector. Optional 『MRS Control Ring (60/100U�U/Olympus 50)』 is available to upgrade to 「MRS Olympus 50 Port」. INON unique "MRS system" compatible. The MRS system uses magnetic attraction to rotate lens barrel for manual focusing like as land operation of a camera. 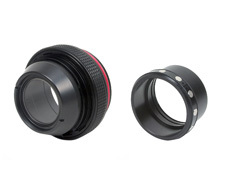 Optional 『Magnet Ring Olympus 50 Set』(attaches on 50mm macro lens) is necessary for manual focusing. Installed on 50mm macro lens instead of conventional focus gear for manual focusing by magnetic attraction. Patented in Japan (3714742) and the U.S. (5,822,622). 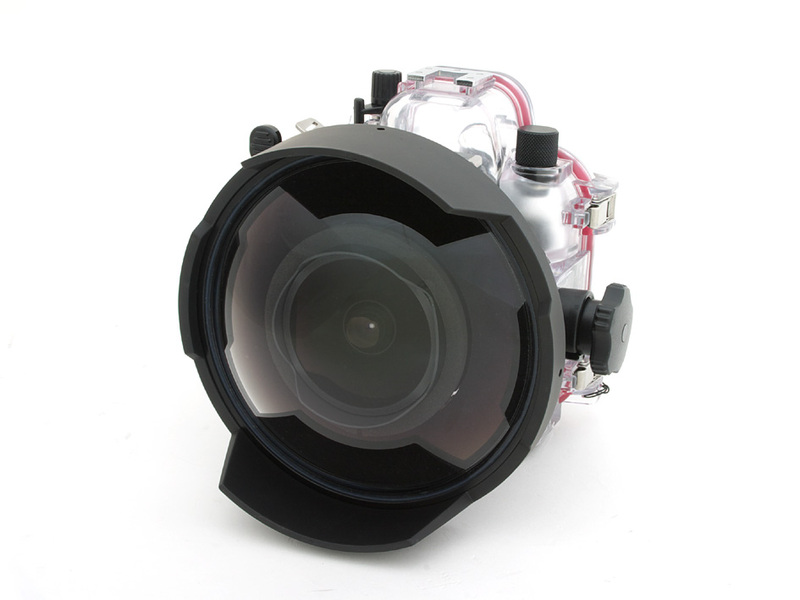 INON 「X1 Dome Port」 is the first optical system using optical glass/multi-coating for consumer underwater camera system to acquire optimum image quality. The 「X1 Dome Port」 provides high-contrast and sharp image with optimum image quality even in peripheral part eliminating flare/ghost, and compatible INON 「X1」 film SLR camera housing is still popular among serious underwater shooters as an ideal underwater camera system for high quality wide shooting. This high quality wide shooting property is inherited to latest INON digital SLR camera housing 『X-2』 and now its reputation is unassailable. The 「Dome Port Olympus」 makes Olympus E system user enjoy the benefit of 「X1 Dome Port」 . The 「Dome Port Olympus」 uses optical glass/multi-coating to provides sharp image as same as 『X1』/『X-2』. INON now supports Olympus「E-410」/「PT-E03」 to use INON “S-TTL” auto strobe 「D-2000」/「Z-240」connecting via fiber optics for simple and reliable TTL auto shooting by an external strobe without flooding risk. The supplied Shade Sheet is effectively block built-in flash light to suppress exposure of built-in flash light on an image (which is drawback of using Olympus genuine dome port 「PRO-E04」) to provide high-contrast result. The INON unique "MRS system" uses magnetic attraction to rotate lens barrel for manual focusing like as land operation of a camera.(*6). The MRS system does not use mechanical gear for smooth manual focusing with minimum torque which is great advantage in macro shooting. 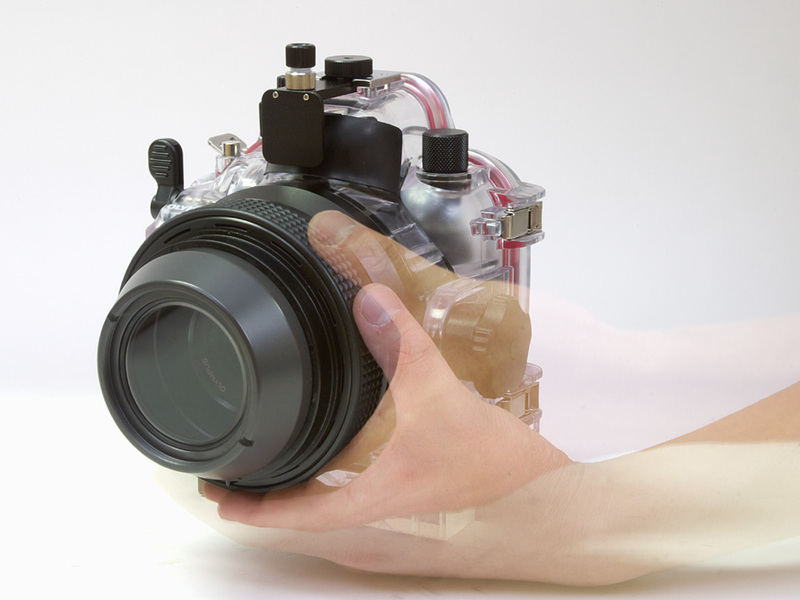 The "MRS system" is free from a drawback of conventional underwater housing to operate a macro lens having large extension amount by a small control dial. Now Olympus E system user can benefit this very well established "MRS system" which is employed for not only INON 『X1』/『X-2』 but other brand housing system. The lens port uses an optical glass with multi coating for high image quality. It is not necessary to prepare full set from the beginning to start underwater shooting. You can buy necessary equipment step by step depending on shooting style, subject and growth of your skill. Below is some of recommended package to start with minimum equipments and easy to upgrade with least investment. M67 screw mount is equipped on the edge of the port to mount either of two types of INON close-up lens (UCL-165M67 or UCL-330). You can choose ideal shooting distance depending on a subject/condition.